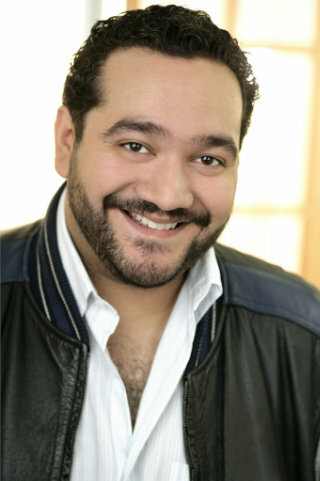 American tenor René Barbera is making major house debuts left and right this season. 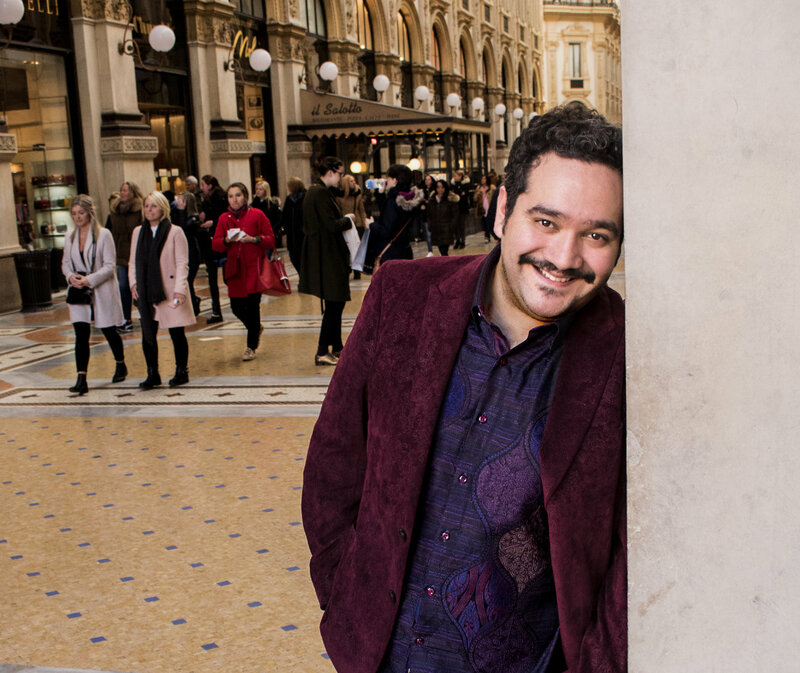 The Texas native is performing primarily in Europe, making his La Scala debut in early April. I am thrilled that I got the chance to talk to René about his path, passions, and love of opera. You are very busy this season! I see you are doing productions every month until at least July. Are you particularly excited about any of your upcoming projects the remainder of this season? I’m ecstatic about making my Teatro alla Scala debut! It is has been a long-time dream to sing at this historic opera house and I’m just beside myself that I’m finally getting to check it off my operatic bucket list. I also am very much looking forward to making my debut at the Palau de les Arts in Valencia. I have always wanted to perform in Spain because my great-grandfather is from Spain. I finally had the absolute joy of visiting Barcelona and Valencia last spring and I have been dying to go back. You have made and are making major house debuts this season. Any highlights so far? So far, making my Deutsche Oper Berlin debut as Edgardo in Lucia di Lammermoor, and returning to my home-state of Texas, unexpectedly, to make my Dallas Opera debut as Alfredo in La Traviata both stand out to me. I also stepped in to sing the Duke in Rigoletto at the Semperoper in Dresden with less than 24 hours’ notice having not so much as glanced at the score for over a year! That was quite a whirlwind and possibly one of the most exciting things I’ve ever done. Singing at the Opernhaus Zurich as Tonio in La fille du régiment was an absolute joy and the audience was so wonderful! I experienced my first encore performance of Ah! mes amis – 18 high C’s instead of the usual 9 – and my brother and sister-in-law were in the audience with my wife. It was incredibly emotional for me and I couldn’t have been happier that this major career first happened with my family present to witness it! 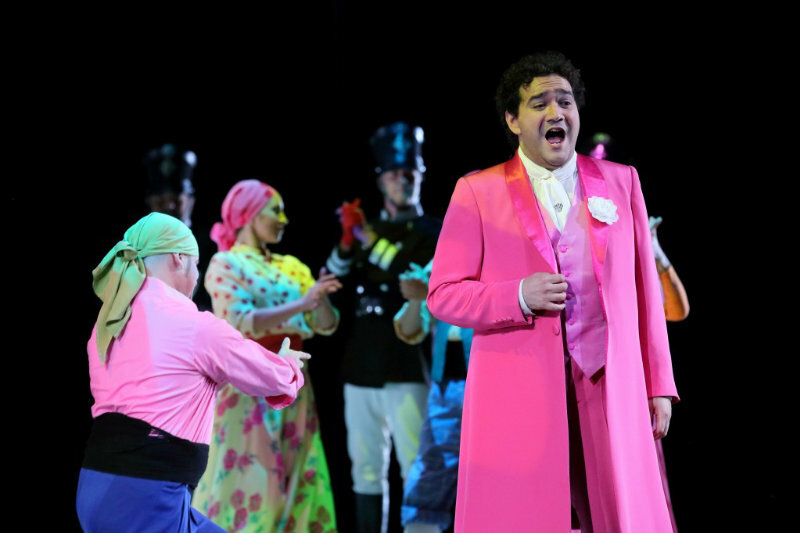 What is one of the more challenging bel canto tenor roles that many operagoers might not realize is so demanding? That’s a rather difficult question. Rossini’s roles tend to be quite hard but I think operagoers very much realize that – considering the sheer number of notes one must sing on any given page! I would say that most people probably don’t realize how hard something like Don Pasquale might be. That duet followed by the aria (“Cercherò Lontana Terra”) right out the gate is quite a challenge and “Com’è Gentil” presents unexpected difficulties. At first glance or listen, the music seems somewhat simple and just so lovely and catchy, at least to me, that I think people don’t realize just how challenging that music really is. Did you grow up listening to and loving opera? Tell me about how you “discovered” opera. I actually listened to my first opera after I had performed in several opera choruses. I recently realized that my first “discovery” of opera was when I sang Amahl in Amahl and the Night Visitors – at the time I had absolutely no clue that I was singing opera and, in fact, had never really given it much thought until sometime last year when I made the connection! So I was quite young, probably 11 or 12 years old. I didn’t, however, really grow up listening to, watching, or loving opera. I fell into it by chance because of my love of singing in choirs and playing piano. I actually wanted to be a high school choir director but, after getting a sizable scholarship at UTSA (University of Texas at San Antonio) and having my voice teacher more than gently suggest I should pursue vocal performance, I went ahead and gave it a shot. I fell in love with the entire art form as whole… seeing everything that went on backstage… the music… the people… the collaboration. It was, and still is, incredible to me. Are you doing the repertoire you love? Are there roles you would love to take on but simply haven’t had the chance to yet? I am starting to sing more of the repertoire I truly love and have loved since I first really got a taste of opera. There are a number of roles I would love to take on – some of which I’ve done a couple of times but really want the chance to sink my teeth into and grow those characters over the course of multiple productions like Nemorino, Edgardo, Alfredo, Tonio, Elvino, Arturo, Il Duca, and others. There are some that I have not yet had the chance to sing, like Tebaldo in Capuleti e I Montecchi, Roberto in Maria Stuarda, Rodolfo in La Boheme (a few years down the line), Nadir in Les Pecheurs de Perles, and perhaps some of the serious Rossini which I have yet to try my hand at. You’re from Texas and spent three years in Chicago while you were a member of the Ryan Opera Center. What led you to choose to live in Berlin? How’s your German? I chose to live in Berlin because Germany is very open to permitting residence for Freelance Artists who wish to base themselves there. Berlin, I’ve heard, is especially accepting of artists and I figured it would be a great place to start our time living in Europe. Most of my work is in Europe at this point; in fact I won’t be performing in the U.S. at all in 2018 and maybe once in 2019, so it just makes sense to base myself here. My German is rather terrible, unfortunately! I was a bad student in college and skipped German classes regularly. Little did I know I’d be a German resident one day…. I see in your bio that you’re a gamer. Do you have a favorite? One favorite is hard to pick…. I’m quite fond of the Zelda series, Fallout, Mass Effect, Overwatch, Diablo series, Dark Souls series (for when I feel like being angry) and pretty much any RPG (role playing) style game. I travel with my Nintendo Switch and my Xbox One S! Nothing in the world exists like those moments when everything just works, even when something definitely didn’t go as planned. What’s more thrilling? Singing on the great stages of the world or cruising at high speeds on a motorcycle? I wouldn’t know anything about speeding on a motorcycle… *wink wink*! That said – they are so incredibly different in experience. I actually feel a really strong sense of calm on a motorcycle – I can feel my stress melt away. On stage I also feel very at home but with a little more on the line (oddly enough). Both are a thrill and experiences I really don’t want to live without – sadly I don’t currently have a motorcycle! The obvious answer is the music, of course, but for me there is something that touches me more than that. It’s the camaraderie between colleagues, the moments when collaboration, music, art, and everything else come together to create an instance in time of sheer beauty and perfection. That doesn’t have to come in musical perfection or anything; it’s sometimes as simple as the harmony you have between yourself and a colleague when something happens on stage and the both of you react in sync and in tune to correct it or adjust to it. Nothing in the world exists like those moments when everything just works, even when something definitely didn’t go as planned. I have been following your career since your terrific Operaphila success. Thank you for sharing your extraordinary voice and artistry. Please realize that many of us lovers of opera look forward to experiencing, and truly appreciate young talent such as yourself. Good luck in your future endeavors! I am a great fan of Rene Barbara and I thank you for this article. I hope we get to hear him sing in Europe this summer. What an exciting, beautiful voice he has! I admire all of the skills that make a great singer and the years it takes to master them. Bravo, Rene!